It’s called the Whole Life Challenge and it’s something that my gym will be doing every year. It’s an online/in your daily life game where you practice everything around fitness from eating well, working out, and paying attention to daily habits every day! It’s really simple. The rules are really clear from food to daily activity and stretching. It’s also fun. There’s a blog, forums, an online scoreboard, and we can do it together! What’s cool is that each day you give yourself a score online so you can actually track how you are doing. There’s literally going to be thousands of people playing all over the world (it’s not just my gym). It’s not free (it costs $45), but it’s totally worth it. At the end of it, I swear, you will be a different person! If you want to know more about it, let me know. 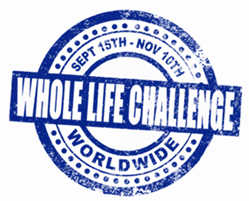 If you wanna sign up, go to www.wholelifechallenge.com and sign up not as a member of an affiliate, but as my friend. I’m extremely excited about this! Last day to register is Saturday, September the 8th . Post number of rounds completed to comments.